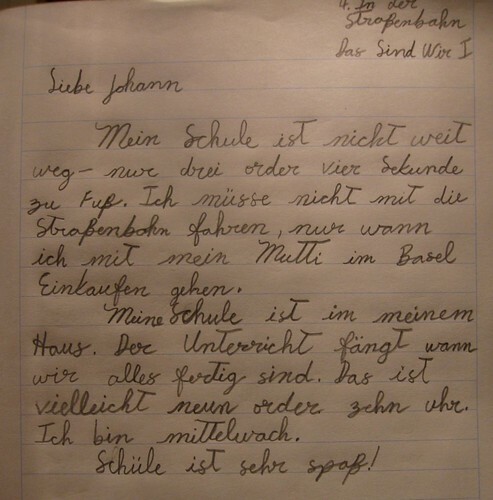 Schooling from the heart: Wir schreiben Deutsch! 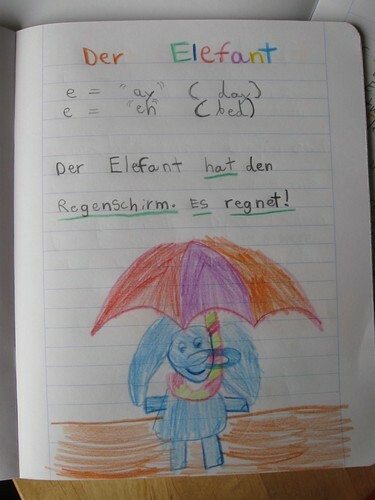 Yesterday I told you about the German lessons I created for my children. Today I want to tell you about two books we're using for book work and how we're making them fun. 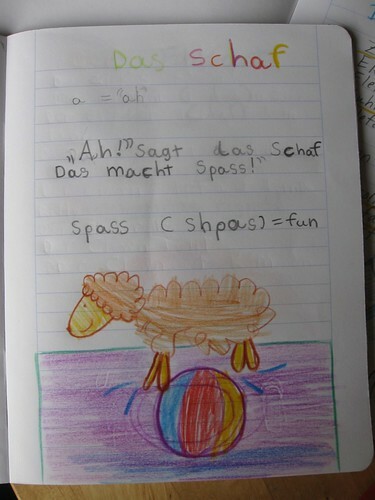 Moonshine, my 8.5 year old, is using "Fun with German" by Lee Cooper. 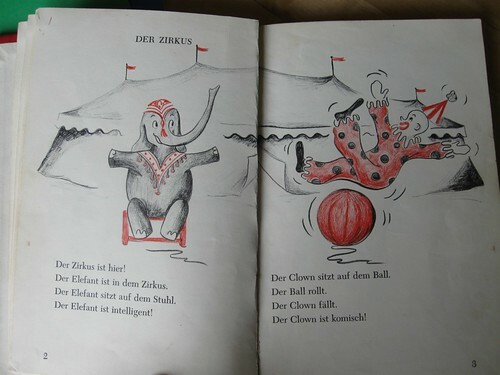 It's written for English speakers, and the point is to be able to pick it up and read in German from the very first page. It's empowering, it's colorful, and it's fun. It actually is. 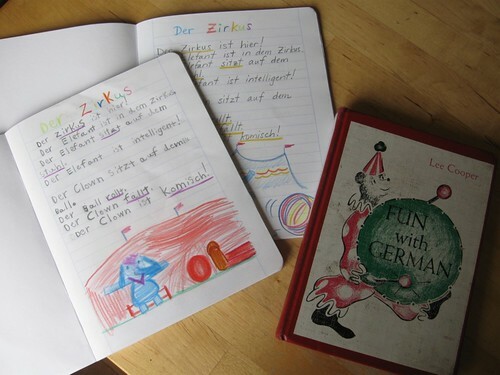 It touches on pronunciation, starting with very small steps, and continuing on in such a simple manner that before long you are actually reading and understanding quite a bit of German. Moonshine is LOVING it. She can't get enough of it lately. It's what I find her doing first thing in the morning and the last thing in the afternoon. We're both hoping it will help her feel even more empowered. She is already tickled by the fact that she can now read in German. 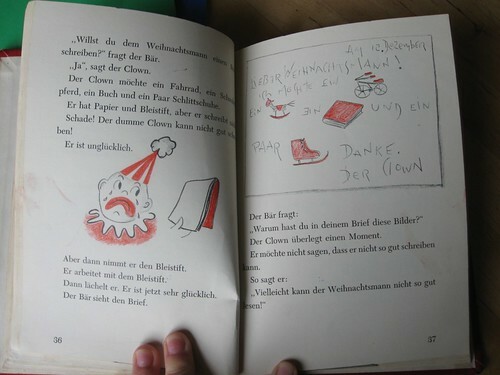 We're taking each page and turning it into a lesson-- reading it aloud many times, copying the writing and the picture, underlining whatever words she wants to underline-- those new to her or ones she thinks are new to her-- and sometimes adding in a new word that she might need help pronouncing. We're using colored pencils to make it more fun. And I'm doing it along with her in my own book. My kids really enjoy embarking on a project together with mom, it feels special and important. And she's so proud of herself already! 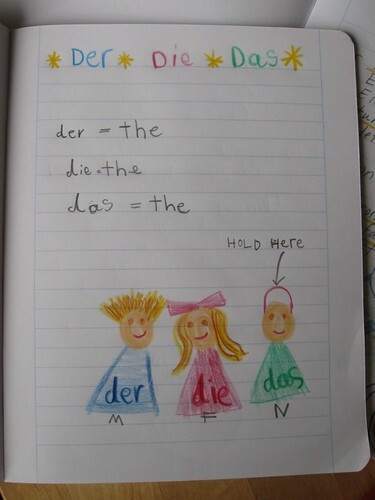 And then she noticed there were so many words that mean "the" -- so I explained and we made a page for them. In Moonshine's drawing below, the gender neutral quality of das is illustrated by a "suitcase" she says. Doesn't it look like a fun book? I can't say enough good things about Lee Cooper's books. They are all like this-- Fun With Spanish (two books), Fun With Italian, Fun With French... They're old enough to be out of print, but there are still many cheap copies to be found in a quick Google search. Sunburst, my 11.5 year old, is using the Das Sind Wir readers by Peter Oram. 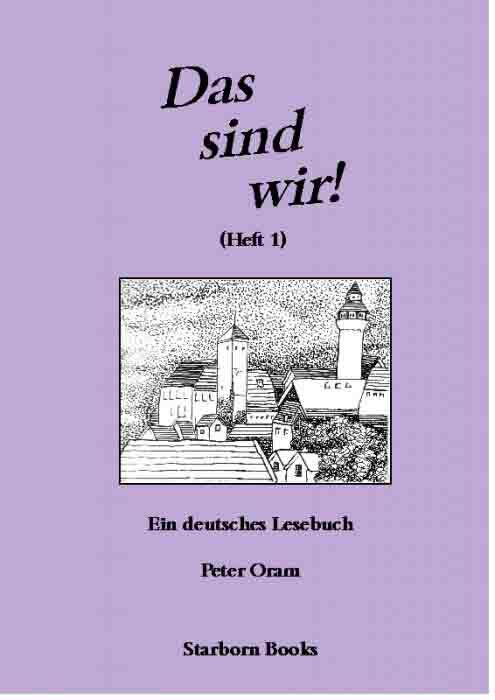 He created these German readers for use in Waldorf schools in the UK, and they are very well done. Each book (there are two) has fifteen lessons. They're meant for Grades 5-6, I think, and they assume that the child has some grasp of the language already... which is perfect for Sunburst. Each lesson has a theme (waking up, school, my city) and at the end of each lesson are the related vocabulary words and phrases for that lesson. In the back of the book there are some questions pertaining to each lesson, meant for the teacher's use, as well as a lesson by lesson glossary. 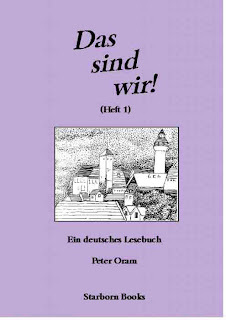 My only problem with this book is that it assumes the teacher is fluent in German. All the material directed at the instructor is also in German... and while I get the gist of some of it, I haven't had the time or the inclination to really sit down and fully grasp how I'm supposed to be using it. So I'm making it up. First we read the lesson together. She likes to read it in German and then translate it aloud to the English equivalent. Then we take this lesson and pretend it's a letter which we have to reply to-- at the end of each lesson, as part of the reading, are questions based on the reading (Where do you live? What do you play? Are you fully awake?) And so we use those as a jumping off point and write a letter to the boy in the lesson. If he talks about his town, then we do, too. And we make sure to answer his questions. We keep our letters in simple little notebooks. Just to give you an idea, here are a couple of Sunburst's (uncorrected)"letters." This is really fun for Sunburst, and again, she loves that I'm doing it with her. We compare what we wrote, and it's really interesting to see how different our letters become. We're doing one lesson per week, and that seems like plenty. Her goal is to be able to check out books at the library and read to her heart's content. I think by the time she's finished with these books she'll have no problem. Certainly she will be able to check out German early readers after only a few more lessons. You can find all of Peter Oram's books at the website Starborn Books. Thank you for the resource. We are studying Spanish so we'll have to check it out. My daughter is similar to your daughter age, little younger. She did a great job! Her little people are really cute! I hope you and your children will have a wonderful school year. What fun!! How exciting for you all to take on a whole new language in such a fun way! I'm all giddy for you! Thanks, Elizabeth! How very sweet of you!! I am going to have to get that book. Das ist ein ganz einfaches Weg Deutsch zu unterrichten! 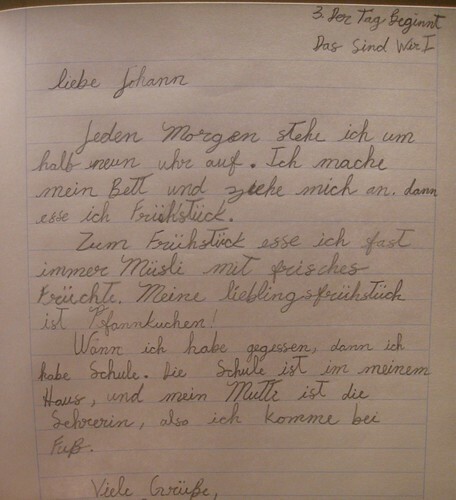 Vielleicht meine Kinder wuerde das auch sehr gerne haben. Das ist ganz schoen! I will look for this book.